Last minute gift ideas contest - win John Lennon book! Home » Books » Last minute gift ideas contest – win John Lennon book! Last minute gift ideas contest – win John Lennon book! Enter to win a copy of John Lennon, Life is What Happens, to be fedex-ed to you before Christmas. 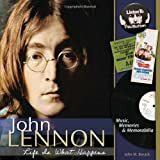 John Lennon —Life is What Happens celebrates the life and times of one of the most influential musicians in pop music history. A singer, songwriter, artist, social activist, husband and father, Lennon’s genius inspired a generation — and continues to do so today some 30 years after his death. This fascinating read features rare images of Lennon juxtaposed by the myriad pop-culture memorabilia created from the height of Beatlemania into the late 1970s and the Plastic Ono Band. Chronicling his musical career, the book includes hundreds of classic photographs, dozens of quotes by and about Lennon, and personal reminiscences from fans and celebrities recalling Lennon’s impact on their lives. All you have to do to enter is suggest a last minute gift idea for mom, and write it in the comments section below. Please put your email in the form where it asks for email – don’t worry – it won’t show up in the comments. Contest closes Friday, December 17 at midnight, and is open to US addresses only. Read rules here. John M. Borack is a Beatles collector and a Southern California-based music journalist whose reviews, columns and feature articles have appeared in periodicals such as Goldmine and Amplifier. Borack has also contributed to The Trouser Press Guide to ’90’s Rock, and has penned the extensive notes for Rhino Records’ Poptopia! Power Pop Classics of the ’80’s, and has served as executive producer for the CD compilations Right to Chews: Bubblegum Classics Revisited.